In 1908, President Theodore Roosevelt became acquainted with the artistic talent of Victor D. Brenner, as he posed for a Panama Canal medal project. The artist, who had already sculpted a plaque bearing the likeness of Abraham Lincoln, suggested a new one cent coin for 1909 to observe the centennial of Lincoln’s birth. Enamored by the idea, Roosevelt invited him to submit design proposals. When word got out that a new Lincoln cent was under development, a controversy erupted. Since the beginning of United States coinage, no real person, living or dead, had ever been depicted on the nation’s circulating coins. Traditionalists argued this precedent, set by George Washington himself, should be honored ad infinitum. Roosevelt carried a big stick in many ways, and forged ahead with the Lincoln cent idea. No new coin type has ever commanded the interest of the public... as has the Lincoln cent. Heralded long in advance, it was issued to an expectant populace on August 2nd.... As soon as it became known that a new coin had been issued, places of distribution were besieged... where long lines formed leading to sub-treasuries, and continued each day until August 5th, when the sign was displayed "No More Lincoln Pennies." Brenner’s obverse design was adapted from his Lincoln plague, featuring a profile of the 16th president facing right. The word LIBERTY was inscribed to Lincoln’s left, and the date to his right. For the first time ever, the motto IN GOD WE TRUST appeared on a one cent coin. The reverse featured two wheat ear stalks on opposite sides of the coin, encircling the inscriptions ONE CENT and UNITED STATES OF AMERICA. At the very top was the national motto E PLURIBUS UNUM, meaning “Out of Many, One”. US Coin Values Advisor has completed Coin Value Tables for the Lincoln Cent, reporting price trends over a long period of time for individual coins of this series. Even though the flap over using a real person’s image on a U.S. coin was quickly washed away by a tide of Lincoln Cent popularity, the public was less enthused about the artist’s initials, V.D.B., appearing conspicuously at the bottom of the reverse. Such a display was galling in the view of many, so mint officials quickly acted to remove the V.D.B. The initials were restored in 1918 on the obverse side to the left under Lincoln’s shoulder, in much smaller letters. The Lincoln Cent was released to the public on August 2, 1909. 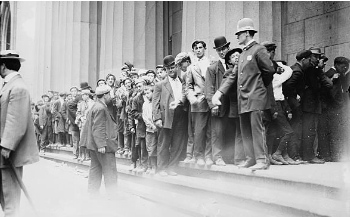 The above photo shows a large crowd in line outside a US Treasury building in New York City, waiting to receive the first examples of the new coin. This was a scene replicated in many locations throughout the nation. The Lincoln Cent was the first regularly circulating U.S. coin to feature the image of a real person. Up to that point in time, the only "person" depicted was various allegorical representations of Lady Liberty. World War II brought about a change in Lincoln Cent composition in 1943. At the time the United States entered the fray, the cent contained 95 percent copper. To better sustain the war effort, copper was diverted away from the Mint, meaning a substitute metal had to be found, and fast. After some testing, zinc-coated steel was selected. The steel Lincoln Cent commenced production in February 1943. By the end of the year, more than one billion of the steel cents were minted. Unfortunately, steel proved to be an unsuitable substitute, so in 1944, Lincoln Cents were once again minted from 95 percent copper. The supply of copper was provided by spent shell casings returning home from the war front. 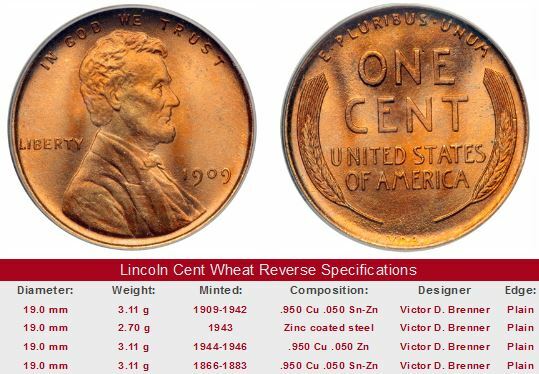 After 50 years of production, the wheat stalks on the reverse of the Lincoln Cent were replaced by a new design centered on the Lincoln Memorial in Washington, DC. The Assistant Engraver of the Mint, Frank Gasparro, created the new look. The Lincoln Memorial reverse was introduced on February 12, 1959. The initials "FG" appear on the right of the building, near the shrubbery. The Lincoln Memorial reverse stayed with us for the next 50 years. In 2009, revisions to the Lincoln Cent were carried out to commemorate the 200th birth of "Honest Abe", and the 100th anniversary of the venerable coin that we have all grown up with. Four different reverse designs appeared throughout 2009, depicting scenes from Lincoln's life. The first new Lincoln Cent debuted on February 12, 2009, Lincoln's birthday. 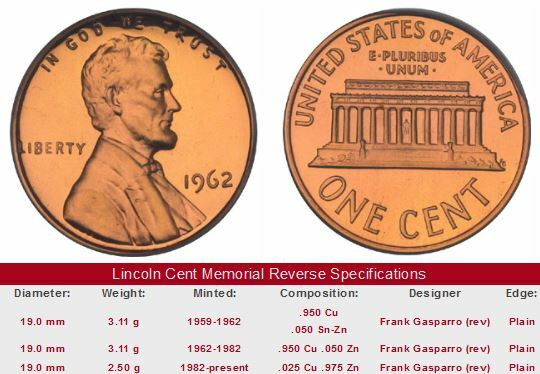 Beginning in 2010, the United States Mint placed a shield on the reverse of the Lincoln Cent. The shield symbolizes President Lincoln's preservation of the United States as one country. The new design is expected to remain in production for many years. Continued competition to acquire these key dates makes them the Lincoln Cents most likely to enjoy strong value appreciation in the future. Key date Lincoln Cents are offered for sale below. Click the link to take you the eBay auction coins. The left hand side of each "Sales Box" is value trend data over a very long period of time for a coin of that date in Good-4 condition. The percent annual increase is computed for comparative purposes. The coin pictured for sale in the right hand side is not necessarily the same condition coin as that represented in the value trend analysis on left hand side.